Lagro resident Vicki Bradley, 66, is a survivor. More than 20 years ago, she survived a diagnosis of stage four breast cancer despite having only a 25 percent survival rate. Today, Bradley is continuing her fight against tumorous cancer, only this time it’s terminal. “I keep fighting. I don’t give up,” Bradley told The Paper of Wabash County. Although she is fighting for her life, she is also fighting for the lives of others affected by cancer and even those who have not been, she said. “When (survivors) walk, we walk to show you that we beat this to some extent,” Bradley said. “We’re still here. We walk to let you know that we’re not giving up the fight. “And I do it for you so that one day you don’t have to handle this,” she continued. 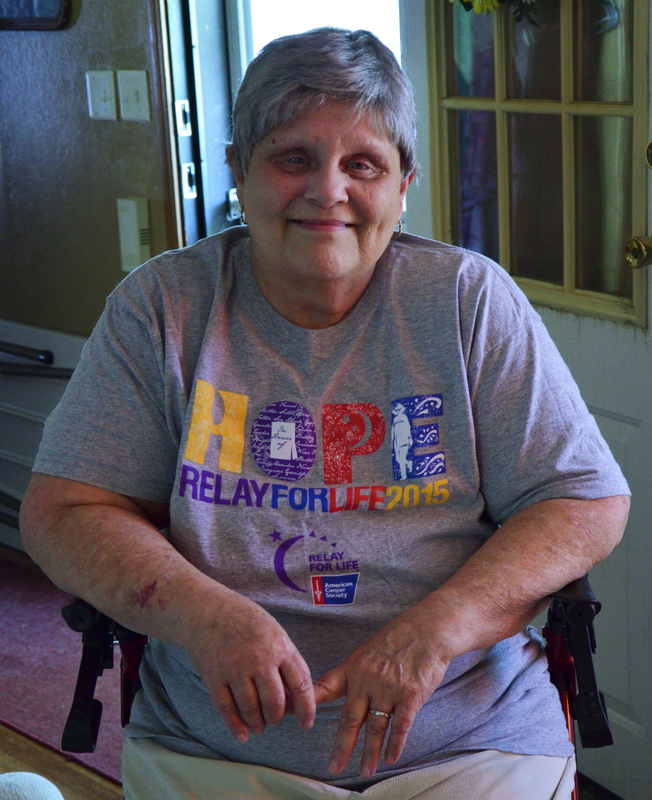 “I’m walking for all of you who don’t have cancer and I’m hoping that you never get cancer. That’s why I walk. I walk so that someday, that cure will be there so that if you get diagnosed that they can cure you and you won’t ever have to go through this. The Wabash County Sheriff’s Department recently received a new officer. Cato, the department’s newest police dog, began patrol duties with partner Deputy Matt Cox Monday July 27. The Sheriff’s Department received Cato from the Brownsburg Police Department when they began downsizing their K-9 units. Wabash County Sheriff Bob Land said some friends of his as the Brownsburg department approached him about taking on one of their police dogs. “Nothing had really been planned at the department until this came up,” Land said, but he knew adding a second K-9 unit to his department would be a good tool to assist his officers. 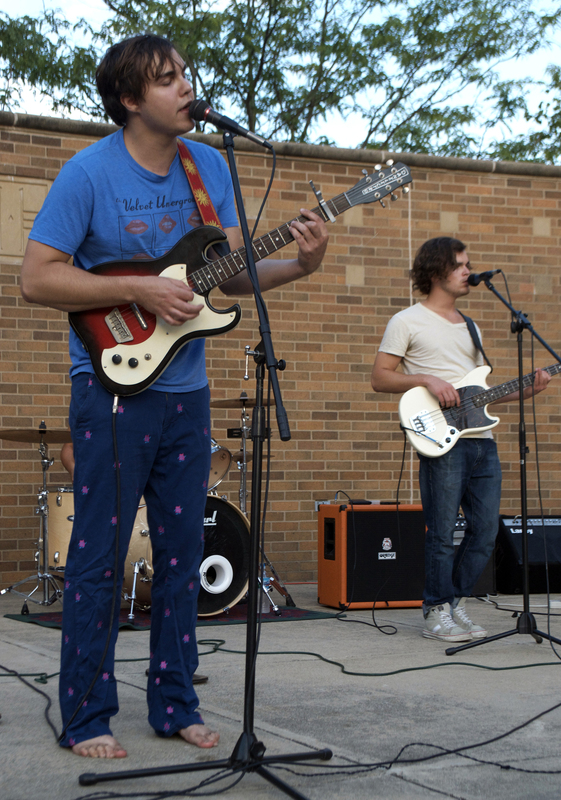 When local father and son duo Machine Solutions left the stage on Aug. 4, Wabash residents weren’t quite ready for the fast and heavy music to follow. Kansas City, Kan., band Rev Gusto stopped in Wabash to play a show at the Honeywell Center Plaza as part of a tour supporting their new album. Their tourmates, St. Joseph, Mo., band Scruffy & The Janitors, accompanied them at Tuesday’s show. Mara Rose-Morales said she and her husband, Jose Morales, saw the event advertised in the newspaper and decided they wanted to try out a new band. She said they enjoyed watching the show and being outside, but Rev Gusto and Scruffy & The Janitors surprised her. More than 200 riders have already registered for the Sixth Annual Dam to Dam bicycle ride. The ride will be on Sunday, Sept. 13. More than 80 percent of those already signed up are from outside of Wabash County, according to Christine Flohr, Executive Director of the Visit Wabash County and one of the members of the ride committee. Several riders also are from out-of-state, with some coming from Virginia, Wisconsin, Illinois, Ohio and Michigan, as well as Indiana. 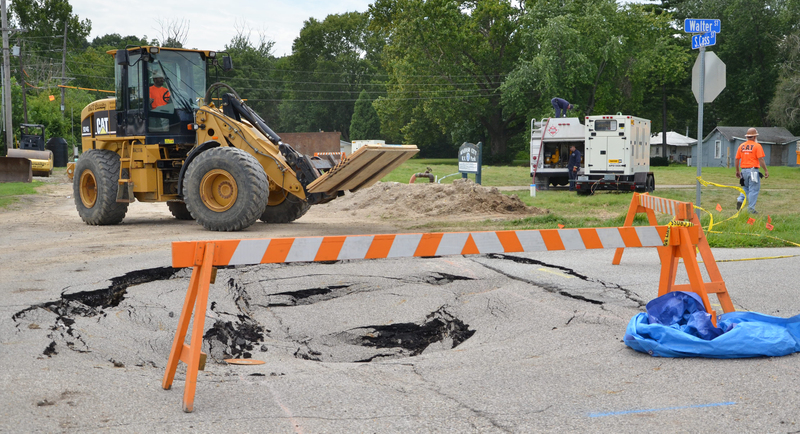 It could take at least one month, and upwards of $1.7 million, to fix a series of sink holes that cropped up in recent weeks on South Cass and South Carroll streets. That was the word Wednesday, Aug. 5, to the Wabash Board of Public Works and Safety from City Attorney Doug Lehman and interim Wastewater Treatment Plant Superintendent Rick Price. The pair was updating the board about the situation, which first appeared in late June due to heavy rain that hit much of the area that month. Two sinkholes, one on Carroll and one on Cass, first appeared about June 28. Crews trying to repair the first two holes discovered a third Tuesday, Aug. 4. The Wabash County Board of Health approved the Health Department’s budget submission for the upcoming year on Tuesday July 28 at the board’s quarterly meeting. This year, the budgets will “look a little different for several reasons,” said Dr. Jeffrey Pyle, president. First, he noted, the board typically has four sub-budgets including the County Health Fund, Local Health Maintenance Fund, Trust Fund and Accreditation Fund. “The Trust and Accreditation were fairly straight forward. Those are both funded by grant monies and those came together pretty routinely like they do each year,” he said. “Currently, we had to move all of our Local Health Maintenance items, that we would normally have in our Local Health Maintenance, all got moved to County Health for the time being. After some lengthy debate on Wednesday, Aug. 5, the Wabash Board of Public Works and Safety delayed a decision on allowing the city to spray for mosquitoes during functions by non-profit organizations. The question came about after the city was asked to spray near the Honeywell House for the July 31 “Jazz on the Lawn” event. The city’ Street Department, which is in charge of spraying, often gets calls from residents asking them to spray their homes when crews are out, City Attorney Doug Lehman noted. “For the most part, we really don’t want to get into that type of thing,” he continued. “However, occasionally there is some type of community event where spraying might make sense. The reason we do it is because it’s a public health issue. The Third Annual Smokin’ for a Cause event is scheduled for Saturday, Sept. 19, at Paradise Spring Historical Park. Gary Henderson said he and other organizers are looking for individuals and teams interested in participating in the event, which will benefit Relay for Life, the LIFE Center and an ALS charity. But they also are looking for non-profit organizations interested in setting up displays to promote itself and what it does.